A group of protesters will gather tomorrow at noon at the Mexican Consulate at 532 Folsom Street to draw attention to the mass grave where 28 student teachers were found in the Mexican state of Guerrero. To find out more about the protest, click here. Last September 26th, 43 student teachers went missing after a clash with local police and only some of their bodies have been found in the mass grave in Iguala, Guerrero. The student teachers had been passing out fliers and raising funds for a protest that would have been held October 2nd to celebrate the 36th anniversary of the 1968 student massacre in Mexico City when as many as 300 students were killed. 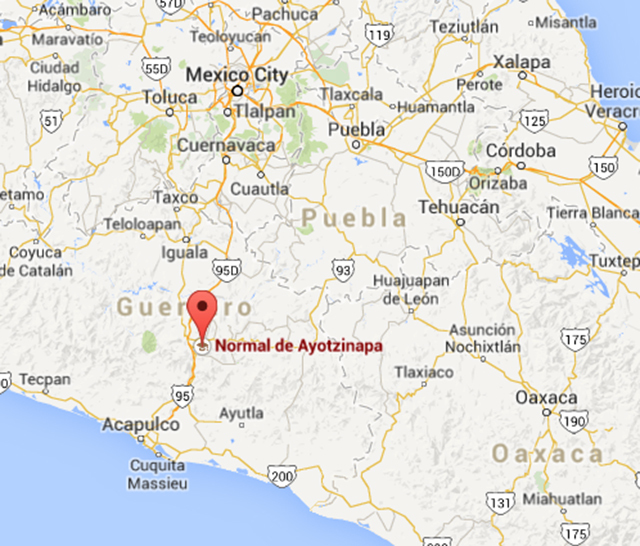 The bodies found in Guerrero had been tortured and dismembered. The victims were young student teachers who go into a career in public education in search of a steady job that will allow them to escape rural poverty and help support their families. The EPR (Popular Revolutionary Army, in Spanish) stated that the 43 student teachers that remain missing were tortured at the Federal Police head quarters as well as at the Army and the Marina’s facilities. In April 28th and October 15th 2012, the official headquarters in the state of Michoacán were also used to torture students who had gone temporarily missing. The EPR considers the statement from the local government – that they will “focus” in finding them– to be a mockery. There is proof that it was paramilitary police who took the student teachers at a raid coordinated between the local, state and Federal police along with the army, the Marina and the paramilitary. The EPR also rejects the thesis that organized crime infiltrated the multiple police enforcement groups. The group states that such thesis in a crime against humanity as is this one, is being attributed to “organized crime”, in a political move to dilute the responsibility of the State as well as to guarantee impunity to the material and intellectual authors of this crime. The thesis of the “faulty State” pretends to “justify” the alleged generalized violence by the organized crime and the narcotraficking. Therefore, according to the EPR, the students teachers massacre in Iguala is in fact the accurate expression of the terrorism of State that is trying to impose the unquestionable criminalization of the popular protest, under the masquerade of “frequent” marches, sittings and popular protests to avoid “violent acts” from happening again, as they did in Ayotzinapan.